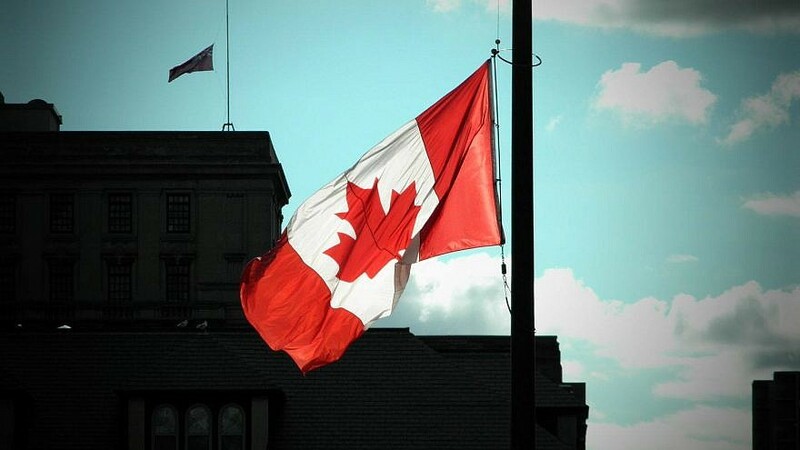 The Canadian flag flying at half mast. Credit: Simon Wiesenthal Center via Facebook. Although Canada’s Jewish community makes up less than 1 percent of the country’s population, approximately 13 percent to 18 percent of Canadians believe that Jews in Canada have “too much influence” in the government, business world and media, according to a recent poll commissioned by the Friends of Simon Wiesenthal Center. (August 22, 2018 / JNS) One in six Canadians express views that may be considered anti-Semitic, while on the flip side, 78 percent of Canadians believe memories of the Holocaust memory must be kept alive, according to a recent survey. The random survey, commissioned by Friends of Simon Wiesenthal Center (FSWC) and conducted by Nanos Research, consisted of a sampling of 1,000 Canadians. The survey found that around 15 percent, or 5 million, Canadians express views that can be construed as anti-Semitic. It found that although Canada’s Jewish community makes up less than 1 percent of the country’s population, approximately 13 percent to 18 percent of Canadians believe that Jews in Canada have “too much influence” in the government, business world and media. The Jewish community was the most targeted by hate crimes in 2016, accounting for 16 percent of all hate crimes across Canada. In 2016, some 221 police-reported hate crimes were against Jews—an increase of 24 percentage points from the 178 hate crimes reported in 2015. Such crimes include graffiti and vandalism, including swastikas drawn on school walls, playgrounds and other communal areas. Other graffiti included “Hitler was right” on a highway north of Toronto, “Jews did 911” on a school in Vaughan, and anti-Semitic graffiti on a Jewish club poster at a school. According to the Canada’s 2017 statistics, from 2010 to 2016, more than 85 percent of hate crimes against the Jewish population were non-violent. Québec displayed the highest percentage of intolerance on average, ranging from 19 percent to 27 percent who imitated the “too much influence” notion. Montreal, Québec’s largest city, has the second-largest Jewish population in Canada, consisting of a little more than 23 percent of the country’s Jewish community. Men polled were more likely than women to hold anti-Semitic viewpoints—17.5 percent to 9 percent, respectively. Granted, these are not huge numbers, but something to be watched. Education efforts are directed at adults and children, but mostly geared towards non-Jews, who tend to be less aware of the Holocaust. Programs take place in public and private schools, as well as across communities, and for police, educators and other professionals. Aedan O’Connor, a Jew who was born and raised in Toronto, where Jews are the most targeted group for hate crimes, echoed Benlolo’s sentiment. “I think that there will always be anti-Semites who think Jews have too much power, and that we shouldn’t stop Holocaust education to alleviate their anxieties,” she told JNS. “The majority believes there needs to be Holocaust education, and I concur.